This book updates and expands on existing material on bed bugs with an emphasis on the worldwide resurgence of both the common bed bug, Cimex lectularius L., and the tropical bed bug, Cimex hemipterus (F.). It incorporates extensive new data from a wide range of basic and applied research, as well as the recently observed medical, legal, and regulatory impacts of bed bugs. Advances in the Biology and Management of Modern Bed Bugs offers new information on the basic science and advice on using applied management strategies and bed bug bioassay techniques. It also presents cutting-edge information on the major impacts that bed bugs have had on the medical, legal, housing and hotel industries across the world, as well as their impacts on public health. 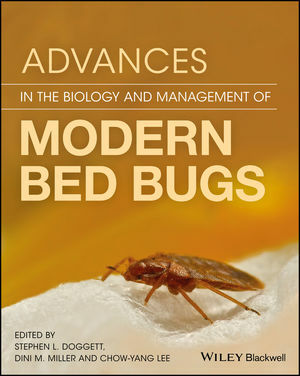 Advances in the Biology and Management of Modern Bed Bugs offers chapters that cover the history of bed bugs; their global resurgence; their impact on society; their basic biology; how to manage them; the future of these pests; and more. Advances in the Biology and Management of Modern Bed Bugs is an essential reference for anyone who is impacted by bed bugs or engaged in managing bed bugs, be it in an academic, basic or applied scientific setting, or in a public outreach, or pest management role, worldwide. Stephen L. Doggett, Department of Medical Entomology, NSW Health Pathology, Westmead Hospital, Westmead, Australia. Dini M. Miller, Department of Entomology, Virginia Tech, Blacksburg, Virginia, USA. Chow-Yang Lee, School of Biological Sciences, Universiti Sains Malaysia, Penang, Malaysia.